A visual history of what became PC gaming's preferred way of buying, playing, and updating games. This week marks Steam's 15th birthday, and while it might be the face of PC gaming now, it didn't shoot to success overnight. The digital storefront has changed dramatically over the years, evolving from a simple portal for Counter-Strike 1.6 to a hub where you can buy games, review them, and even participate in their development—if you're not too busy selling hats, cards, and $400 knives in the community marketplace. Let's turn back the clock and look at how far the ubiquitous platform has come. 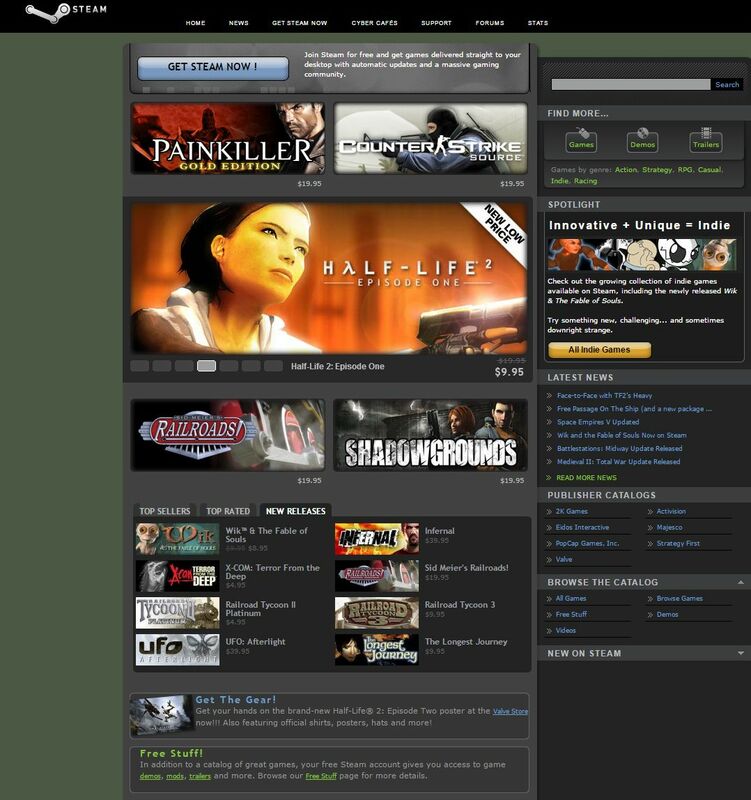 On September 12, Steam began life as a way for Valve to control the patching process for games like Counter-Strike, as well as curb cheating and provide easier access to any content the developer produced. All was not hunky-dory, though; many gamers saw Steam as a threat to PC gaming, requiring a constant internet connection at a time when only 20 percent of American households had access to broadband internet. It didn't help that Steam's authentication servers struggled to cope with user demand, regularly locking players out of the games they had purchased. Add to that the slow download speeds, the clunky interface, and the frequent patching, and a lot of gamers were left with a sour taste in their mouths. 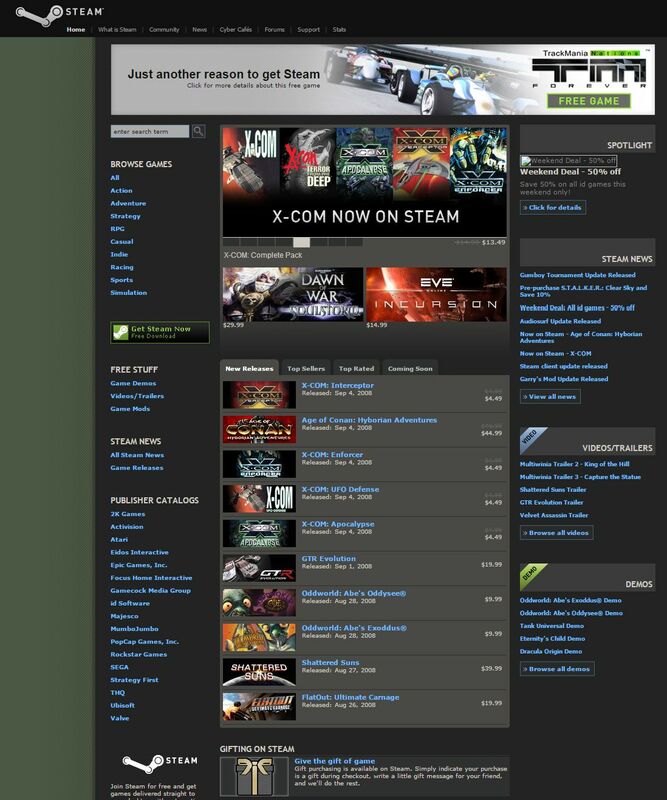 In the image above, Steam's narrow focus is immediately evident: the only games mentioned are Valve's own, and there is no way to purchase them from the site. The Steam client itself lacks a storefront, focusing entirely on connecting players rather than getting them spending. The release of Half-Life 2 is arguably the reason Steam is what it is today, and the game's dominance of the storefront reflects that. 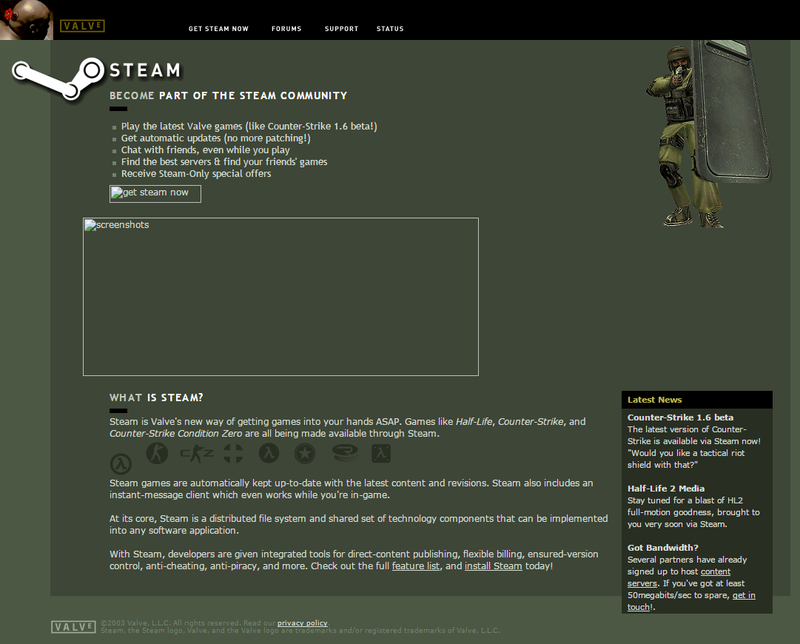 Valve didn't want you to forget: to play the universally-acclaimed shooter, you had to sign up for Steam, too. 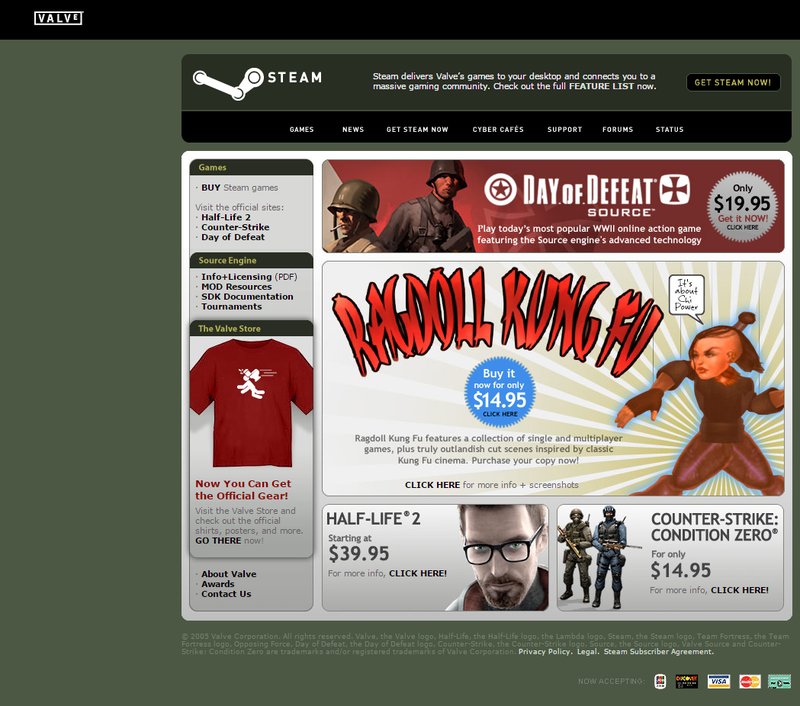 Ragdoll Kung Fu and Darwinia become the first non-Valve games to hit Steam. This was big news, marking the platform's shift from being essentially a downloader and server browser to a proper store. Now we see Steam really starting to take shape. The then-novel concept of digital sales is born, hinting at what was to come. Free demos and HD videos join the catalogue. With almost 100 games available, the issue of visibility starts to rear its head. A proper search functionality, integration of Metacritic ratings, and filters like Top Sellers and New Releases make the storefront a whole lot more usable. 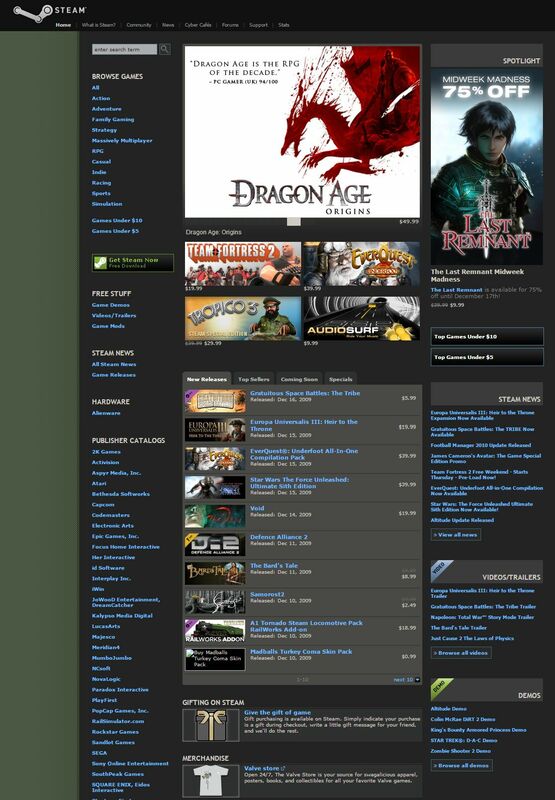 The addition of community forums is Steam recognizing its user base as an asset like any other. Within the Steam client itself, the debut of the Steam Community platform brings with it many crucial features, including stat-tracking, friends lists, community groups, and voice chat. Browse-by-genre links and a greater focus on the New Releases list make keeping track of Steam's ever-expanding catalogue slightly easier. Meanwhile, the Spotlight feature, the image slideshow, and the large banner ad grant select games prime exposure to Steam's 20-million-strong user base. On the software front, the rollout of Steam Cloud makes it significantly easier to play the same game across multiple computers, providing automatic synchronization of game saves, key bindings, and configuration settings. The addition of the Under $5 and Under $10 categories signal the beginning of Steam framing games as impulse buys, forming the basis for the notorious Steam backlog of cheap games you'll probably never end up playing. Discounts are now presented as percentages, making it significantly easier to spot a bargain. The Steam Stats activity graph reminds visitors just how big Steam is getting, while the addition of Mac games marks Steam's first push to expand beyond the Windows PC market. In response to an increase in account fraud, Valve deploys Steam Guard, providing two-step login protection first via email, then later through the Steam mobile app. Modders, meanwhile, rejoice over the long-awaited arrival of Steam Workshop, which allows user-created content to be distributed directly on Steam. The growth of DLC sees the addition of a Downloadable Content filter to the New Releases list, as well as DLC and Demo labels added to the top-left corner of game thumbnails. The Steam Greenlight initiative rolls out, establishing an increased focus on openness while at the same time exacerbating the flaws in Steam's curation. Untethering itself from the desktop, Steam releases its mobile app, enabling chat, purchases, and remote game installation on-the-go. This is followed up by the launch of the Steam Marketplace, allowing in-game items to be bought and sold for Steam Wallet funds. In advance of SteamOS, Linux support comes to Steam, taking over Mac's slot on the navigation bar and earning itself a tab on the Featured Games widget. Big Picture mode arrives, too, the harbinger of Valve's ambitions to enter the console-dominated living room. Experimentation continues with the advent of Early Access, though its initial niche appeal limits its prominence to an announcement banner and a new search category. 2013 also sees the arrival of Family Sharing, permitting users to share their games library when it's not in use. Accompanying this is support for user reviews of games, complementing the existing Metacritic scores. User profiles also expand with an RPG-like leveling system, partly intended to stimulate community behaviour like trading items and posting reviews. The Recently Updated widget reflects the shift from games as products to games as a service. Linux concludes its short stint on the navigation bar—not surprising, given the lukewarm response to SteamOS. Feature-wise, the advent of In-Home Streaming transforms laptops and tablets into wireless monitors for a high-end PC. Broadcasting offers a built-in alternative to Twitch, allowing Steam users to watch their friends play and share their own gaming sessions. Family View options enable parents to limit the content their children can access. The end of 2014 saw the Discovery Update, more or less introducing the design we know today. Personalized recommendations adorn the front page, from Steam's own Discovery Queue to the suggestions of popular community Curators. 2015 added a hardware section to support the Steam Controller, the Steam Link, and Steam Machines, while 2016 introduced a VR category to accommodate the release of the Oculus Rift and the HTC Vive. 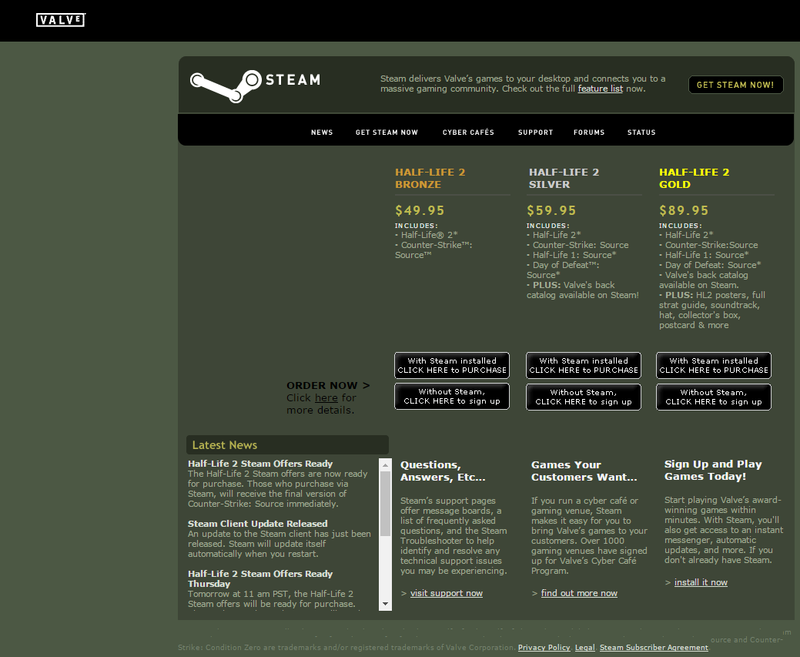 Steam doesn't look intensely different today than it did last year or the year before that, but boy is it. Steam Greenlight is gone, replaced now with Steam Direct which allows anyone to submit a game to the store, no community approval required. And thanks to Steam's latest policy change, just about any game at all (so long as it isn't illegal or a 'troll') is allowed to appear on the platform, with new filtering tools in place so that users can choose to avoid or not avoid adult content. We're just beginning to see what this might mean for Steam's future library. Valve has also pushed harder into the livestreaming space, including developer streams on game pages, and soft-launching Steam.tv, which could become a Twitch competitor in the coming years. Meanwhile, Steam Machines pretty much failed, but Valve hasn't given up on Linux, with a recent Steam Play update making more games available on the open source OS, including Valve's SteamOS distribution. 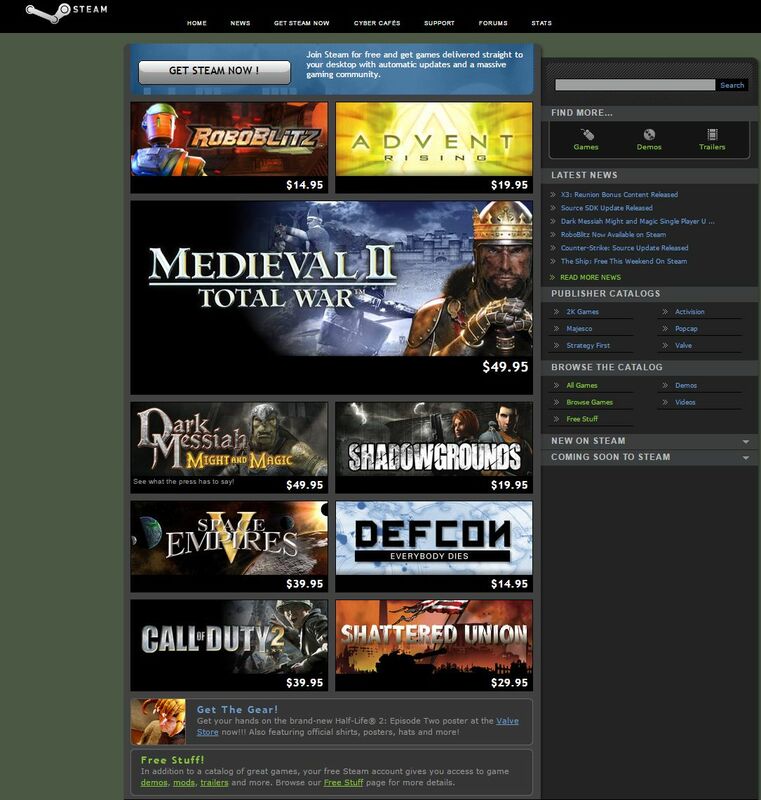 Though it's slow going, Steam also has a growing video section, and while initially somewhat controversial, its non-game software section has become a normal part of the store. And while not all of its hardware plans panned out, Valve has continued to push VR hardware and software, growing the VR section of Steam from a tiny seed into a major part of the store. It feels like Steam is now at a new starting point. The library has already become massive as a result of Steam Greenlight and Steam Direct, but from here on out, it should become even more massive as well as more diverse. Valve is adding discovery features—including new developer and Curator hub pages—to keep pace, and will probably continue to do so as the library grows and grows. The Steam of the future will likely look very different, just as today's Steam is hard to recognize in the Counter-Strike updating system that spawned it. This article was originally published July 2016, and has been updated for Steam's 15-year anniversary.